As the year draws to a close and the sparks stop flying in the GCN Lab, we take a backward look at products that earned high marks from the review crew. Testers who set up new gadgets day in and day out can't always count on finding real whiz-bang winners. But a few products leave good impressions long after we ship them back to their makers. This year we chose 10 products tested in 2000 in the GCN Lab as the best. Unlike previous years' winners, chosen for traits such as portability or ruggedness, this year's standouts were more varied and illustrated healthy technology gains on many fronts. Many of them were slim not only in size but in price.
' 'The Eizo eClient 530L from Eizo Nanao Technologies Inc. of Cypress, Calif., was one of the first thin client systems we tested extensively [GCN, Sept. 11, Page 1]. The beauty of a thin client is that its files stay safely on the server. The user has only a marginally intelligent monitor'we like a space-saving LCD'a keyboard, a mouse and a cable back to the server. 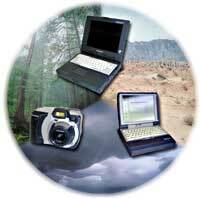 Panasonic Toughbook (top) got better marks than two other products in toughness tests. 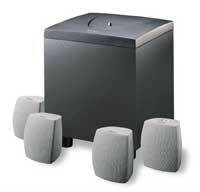 The four-speaker LCS-2514 sound system delivers good audio and is priced at $80. 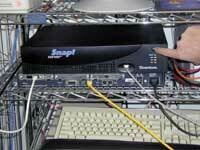 The Snap Server fits easily into a rack and configures itself automatically on most networks. 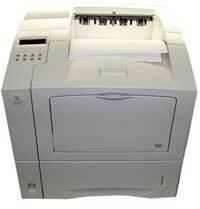 The 16- by 17-inch Xerox N2125 network printer performs as well as printers twice its size. Turning the monitor on automatically makes a connection to the server, which prompts for a password. Turning the monitor off automatically saves the work and logs out the user. Most business applications run just fine on a thin client, though high-end computing requires at least some local power on the desk. A thin client system is easy to administer because users can't install or delete software or mess up system files from their monitors. And when the time comes to upgrade, the clients stay put. Only the server needs upgrading'potentially a way to large savings over the long haul. Storage is finite and getting more so in the networked office. Anyone who has ever seen the emergency message 'Warning: Server drive X is almost full' remembers the ensuing havoc. Work can't be saved, e-mail flow stops and, often, the blue screen of death shuts out angry users.
' What many offices need is a high-capacity, easily administered storage device to add in a pinch, or as a planned upgrade. The Snap Server 4000 from Quantum Corp. of San Jose, Calif., fills that need well [GCN, Sept. 25, Page 33]. The Snap Server 4000 adds 120G of storage to an existing network in hardly more time than it takes to unpack the box. Set it down, plug it into a 10Base-T or a 100Base-TX network, and flip the power switch. The Snap Server configures itself and appears to users as just another network drive. In our tests, transfer rates were about as fast as for a standard network drive. We ran a video feed from the Snap Server with no lag. The storage appliance did hit some minor snags with early versions of Microsoft Windows 2000, but they were easily fixed and probably will disappear as the operating system matures. Portability and ruggedness have only recently started to go hand in hand. Panasonic Personal Computer Co. has been leading the charge to build more rugged notebook computers and, until recently, was the only maker to put portables through tough military testing.
' The Panasonic Toughbook CF-17 takes the ruggedness advantages of its predecessor, which we ran over with a car [GCN, April 24, Page 31], and shrinks them down to almost subnotebook size. The CF-17 weighs only 4.5 pounds in a shell-like magnesium case. It packs a 300-MHz Celeron processor with 64M of RAM and a 4.3G hard drive [GCN, June 5, Page 31]. It has a tiny, 8.5-inch screen and also a tiny keyboard, which might turn off some users. But anyone who does a lot of genuine field work would have a hard time finding a better companion. We tried, but we could not break the notebook with either drop-shock testing or extensive moisture and heat in a rainforest environment. And the CF-17's weight never bogged us down while traveling. Few network printers live up to their billing. Either they are overpriced, space-hogging monsters or they simply can't keep up with the demands of a busy workgroup. A line forming at the print bin is a telltale sign that the network printer is too slow.
' That won't happen with the Xerox DocuPrint N2125. It's a speed demon in a surprisingly small, 16- by 17-inch case [GCN, Oct. 23, Page 31] and impressive from the moment it starts printing. Detailed test documents could not subtract much from the advertised 21-page-per-minute speed. Most large documents, even with some graphics, printed at an average 19 ppm through the 10/100Base-TX Ethernet interface. The N2125's toner cartridge produced 9,000 sheets without any degradation in print quality.
' For any company to stand out in the crowded computer speaker market, its product must be unique. That's the case with the Labtec LCS-2514 from Labtec Inc. of Vancouver, Wash. The four-speaker sound system is well-suited for virtual reality and training applications. The LCS-2514 puts two speakers behind the user, two in front and a subwoofer on the floor [GCN, May 8, Page 29]. Although the satellite speakers are rated at only 4 watts each, they yield perfect'and quite loud'harmony for almost any sound produced. In a market where standard two-speaker systems go for more than $200, the LCS-1514 setup gives better performance and two extra surround-sound speakers for just $80. It can create a multimedia center without blowing the budget on sound. Database software that doesn't frustrate the user with chains of puzzling windows and numbers of illogical choices is rare.
' That's why, despite minor problems with the Sliding and Printing options, which left overly large gaps between lines of text, we judged FileMaker Pro 5 from FileMaker Inc. of Santa Clara, Calif., one of the best products of 2000. It took only 45 minutes to construct a database of 25 contacts. Those 45 minutes included the software installation but no reading of instructions. For other database products, it's generally necessary to study a good portion of the help file to construct a database. The $250 FileMaker 5 package handles data for small to medium-sized offices, and there's a server edition for large groups. Don't worry about training your office staff to use the software'FileMaker comes with a great tutorial that eases you into the basics of database construction and covers everything the software is capable of doing [GCN, April 24, Page 29]. Allow plenty of time to go through the tutorial. Toward the end it covers quite complex ideas and capabilities.
' After testing biometric technology for a good portion of the year, we found ourselves liking U.are.U Pro from DigitalPersona Inc. of Redwood City, Calif., for fingerprint authentication. The name is clumsy to write and even more cumbersome to say, but U.are.U Pro does more than just log users on to a computer. It also can log them on to Internet accounts [GCN, Nov. 6, Page 1]. Its optical chip sensor was accurate. We seldom had a problem logging on to a client PC or an e-mail program. Unlike most biometric devices, which run strictly under Windows NT, the $150 U.are.U Pro device operated smoothly under Window 98. It stores passwords and user names in an encrypted file in the Windows Registry. The only drawback is that it's too light for stability on the desk, and that can make authenticating fingerprints awkward. A native Universal Serial Bus connection makes up for the design, however, and U.are.U Pro is easy to install and set up the software. One of the neatest programs we've seen in the lab this year takes a simple idea to a new level. It can help you figure out any connectivity problems you might have. 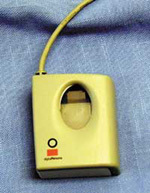 The iPaq has a modular bay on the left and a removable right wing for access to the hard drive and a vacant memory slot. The U.are.U fingerprint authentication reader makes Internet log-ins easier and faster, but it doesn't do log-outs. NeoTrace does more than ping routers and computers; it also shows their locations as data travels across the Internet.
' NeoTrace from NeoWorx Inc. of Dayton, Ohio, graphically shows where your IP packets go once they leave your computer. It traces the route of a packet all the way to the destination and lists all the nodes through which the packet travels as well as all the information it can obtain about those nodes through the Internet utility whois. What makes NeoTrace uniquely valuable isn't the rudimentary use of ping and whois, but rather the way it outlines the trace in one of four ways, the default being a large map of the world describing each node passed [GCN, May 8, Page 1]. The price is low at $30, and resource requirements are minimal: Windows 9x or NT, an Internet connection and 2M of storage. Tripp Lite Inc. of Chicago came out this year with one of the most powerful uninterruptible power systems we have yet seen in a small 5- by 18-inch black case.
' The Unison SU1000RT is ideal for any office server that needs protection from power interruptions. Even though this power wonder seems far from light in weight or price'30 pounds for $799'it delivers in the event of an outage. At less than half of stored power capacity, we hooked up three PCs and a 21-inch monitor to the unit and disconnected it from wall current. It kept everything running nearly 30 minutes [GCN, June 19, Page 29]. The good administration software can page the network manager in the event of power loss. And the manager can feel confident of having at least half an hour to fix the problem. 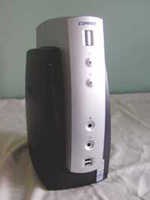 One of the first so-called legacy lite computers that we saw in the GCN lab was also one of our favorites.
' The iPaq from Compaq Computer Corp. is no gigahertz monster. Our test unit was a mere 500-MHz Pentium III with 128M of RAM and a dedicated 4M video card [GCN, March 6, Page 27]. In view of those modest specifications and a meager 6.4G hard drive, why did we choose the iPaq as one of the best products of 2000? It worked better than most gigahertz machines we've looked at. It gave solid performance all around without being a speed demon. Not only was the iPaq body small, it also had a tiny price'$799'and two convenient USB ports in front. We've seen UPS devices bigger than the 14- by 6- by 10-inch iPaq frame. But there's nothing small about the iPaq's usefulness. In every way, this mini-PC is a strong business system.